Delicious marinated grilled pork skewers served with grilled peaches, arugula and a refreshing cucumber mint sauce. I made this for my family recently and they absolutely loved it. I’m hoping this recipe will inspire you to get grilling this summer. I’ve partnered with Smithfield to share their Smithfield “Get Grilling America” Photo Contest, along with my own grilled pork recipe. This summer, Smithfield has set out to encourage Americans to grill fresh pork and feature the ease and versatility of grilling fresh pork via recipes, videos, and tips. You’ll have a chance to win thousands of grilling and cash prizes through a fun photo competition. Visit www.SmithfieldGetGrilling.com for fresh pork grilling tips, tricks, and recipes from Smithfield pitmasters, as well as content from Smithfield’s partners, Weber, Kingsford, Budweiser, Bud Light, TABASCO, and the National Pork Board. Along with tips from the Smithfield pitmasters, you’ll also find feature stories on Smithfield pitmasters and how they got into competition barbecue. Visit SmithfieldGetGrilling.com to submit your photo within one of the four contest waves (July = The Ultimate Grilling Party) for a chance to win a grand prize of $5,000 (limit one entry per contest window). Photos will be judged on the appearance/quality of the photo, how well it matches with the overall theme for the entry period, and popularity based on votes. For each of the four contest entry periods, the five entries that receive the highest score will be declared a Finalist, and will receive a Weber smoker. Additionally, hundreds of prizes will be given out to those who submit a photo (one per entry period) or vote on a photo (limit one drawing entry per day), via weekly drawings. Visit www.SmithfieldGetGrilling.com for more information. For my grilling recipe, I used Smithfield Marinated Fresh Pork. I regularly pick it up from my local Publix or Walmart. I love the simplicity of preparing Smithfield Marinated Fresh Pork, and you all know that I like to keep things simple in the kitchen. Already perfectly slow-marinated and seasoned, you cook it straight from the bag. Perfect for popping into the oven or placing on the grill. It doesn’t get much easier than that. Before firing up the grill, you’ll want to prepare the cucumber mint sauce. You can prepare it a day in advance if you like. This is a yogurt based sauce that pairs great with just about any kind of meat, but I particularly enjoy it with grilled pork. It’s wonderful over salad greens too. The minty fresh flavor is perfect for summer grilling. My parents were over the day this meal was prepared. My dad is the official grill master of the family, so he was outside manning the grill for me. Thanks Dad! Before Dad got busy grilling, I skewered the pork onto wooden skewers that had been soaked for about an hour. Since Smithfield Marinated Fresh Pork is all ready to go, all I had to do is cut the meat into bite-size pieces first. Easy peasy! The pork skewers shouldn’t take more than 15 minutes on the grill to cook. If the size of your grill permits, place the peaches onto the grill during the last few minutes of cooking time. Otherwise, place them on the grill as soon as you have removed the pork. To prepare the peaches simply cut them in half, remove the pits and brush on some olive oil. I also sprinkle mine with a little salt and pepper. Grill just a couple of minutes on each side. 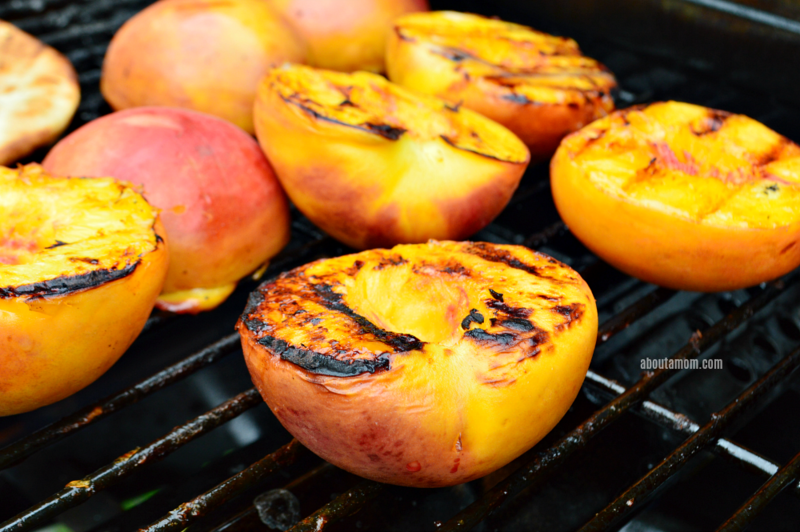 I usually leave my peaches on the grill an extra minute, because I love a little bit of char on them. Serve family style on a big platter. I served mine along with some Naan flatbread that I placed onto the grill for a minute on each side then brushed on some olive oil. YUM. Place some arugula and sliced red onion onto the center of the platter. On either end add your marinated pork skewers and grilled peaches. Don’t forget your cucumber mint sauce! Don’t these marinated pork skewers look delicious y’all? Seriously, this might just be the best meal I have prepared this summer. I can’t get over how easy it was. If you’re having any reservations about the cucumber mint sauce, I hope you’ll give it a try anyways. I promise you won’t regret it. It is so refreshing and a nice change of pace. The peppery taste of the arugula, paired with the sweetness of the peaches, the crunch of the red onions and the refreshing flavor from the cucumber mint yogurt sauce is an incredible combination of flavors and textures. Prepare the cucumber mint sauce. Combine all ingredients in a small bowl and stir until well combined. Refrigerate until ready to use. Prepare the peaches. Cut each piece in half, removing the pit. Brush with olive oil. Sprinkle with salt and pepper to taste and set aside. Using a sharp knife, cut pork into 1-inch pieces. Thread pork cubes onto skewers. Lightly oil grill. Grill over medium heat for 5 minutes on each side, or until thoroughly heated and pork is cooked through. Place peaches onto grill and grill for about 2 minutes per side, or until softened and warm throughout. Serve grilled pork skewers and peaches with arugula and red onion salad. Smithfield Marinated Fresh Pork is the go-to for a delicious, hassle-free dinner that’s ready in about 30 minutes or less. With the prep work already done for you, simply grill, roast, sauté, or slow-cook for a meal that’s perfect for any night of the week. That looks absolutely amazing! I love that fresh combination of flavors. That cucumber mint combined with the peaches and grilled pork sounds like heaven. I would love to give this a try. Om nom nom. Ok, now this sounds GOOD. I want to to make that cucumber mint sauce asap! You made it look so good! I’m always looking for ways to cook up pork for the kids. Skewers is a great idea! You cooked that pork to perfection and I have got to try grilled peaches. I will try this as a special summer meal and I love fresh mint in anything. Yes, please! This looks delicious. Thanks for sharing! Oh my goodness. These would be such a treat on one of our grilling days. I’d love to try the sauce! These grilled pork skewers look amazing. I have been trying to find new recipes to whip up on the grill. I will have to give these a try! Yum! 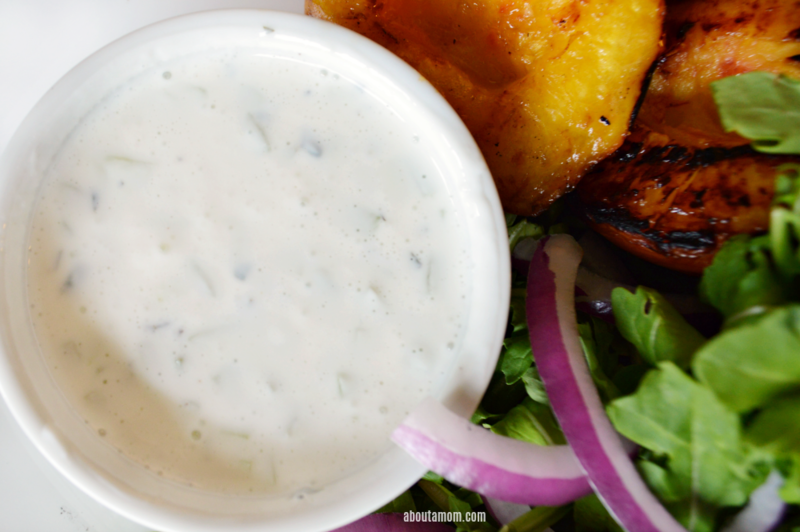 I love grilling season and these grilled peaches look perfect with that grilled pork and cucumber mint sauce. Wow, those flavor combinations are amazing! Sounds like I’ve got a new recipe on my list. I will never so no to Smithfield. They have some amazing products as is obvious with this recipe! I wouldn’t mind that Weber smoker! This sounds like an awesome recipe so good luck to you! I don’t make pork that much and I don’t know why! These skewers look amazing, and those peaches on the grill? Whatttttt! Amazing! I love Smithfield pork! They make it so easy to make a delicious dinner. This recipe looks amazing! It’s time to step up our grilling game. No more burgers and hot dogs. This all looks absolutely incredible. Those peaches! 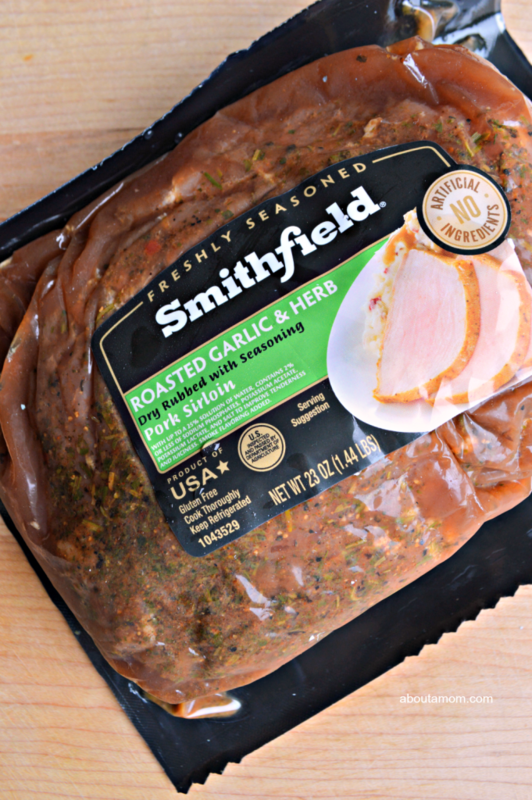 The Smithfield Pork Sirloin Roasted Garlic and Herb was perfect for this recipe. I need to add this to our weekend BBQ menu! Cucumber mint sauce sounds amazing! Great recipe I just have to switch out the pork with chicken. I wish they carried Smithfield Pork near us. This looks and sounds like an amazing recipe! That was one delicious meal you put togerher. 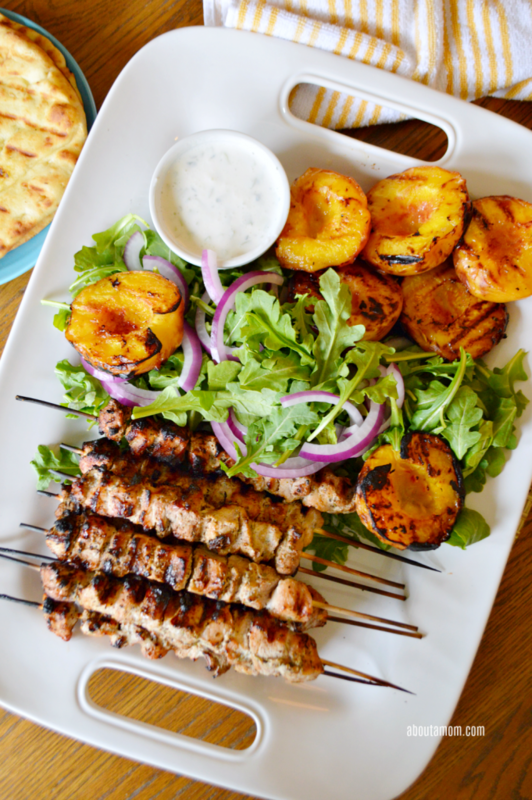 I love grilled pork skewers and the baby arugula and grilled peaches are the perfect sides. I love Smithfield Pork so much! The cucumber mint paired with fruit is my kind of pairing. These look so delicious. I want to try this recipe. 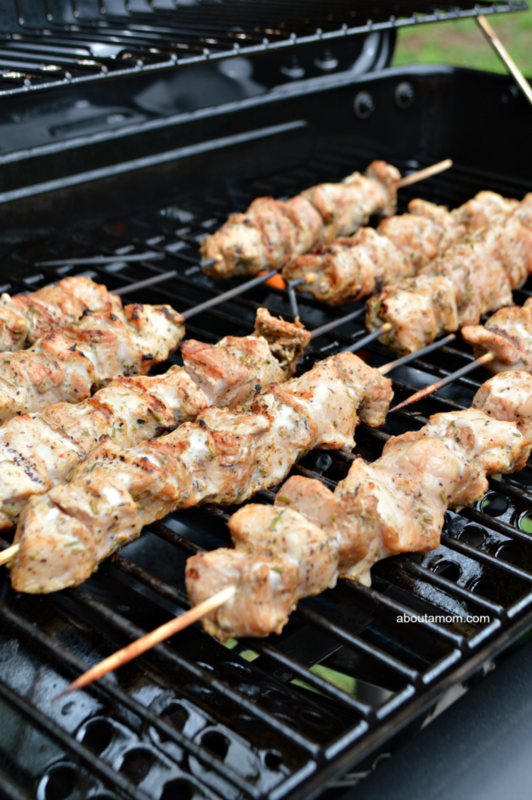 I made pork skewers last week on the grill and they were so good. 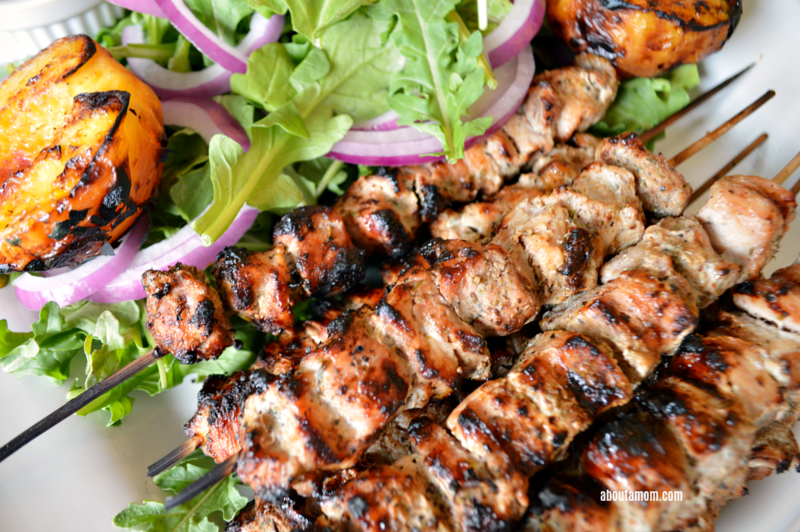 Your Grilled Pork skewers with peaches and cucumber mint sauce looks so delicious! I will have to try making this recipe. These look so moist and full of flavor. A mouthwatering moment. I think this would be a recipe that my family would like, although I may reduce the amount of mint by just about half. Im going to gather my ingredients now for this recipe. It will be perfect for dinner tonight; I have family coming to visit and I really wanted a recipe to impress them with. Thank you for sharing it. Pork has been my go to meat of choice for a while now and we love Smithfield. 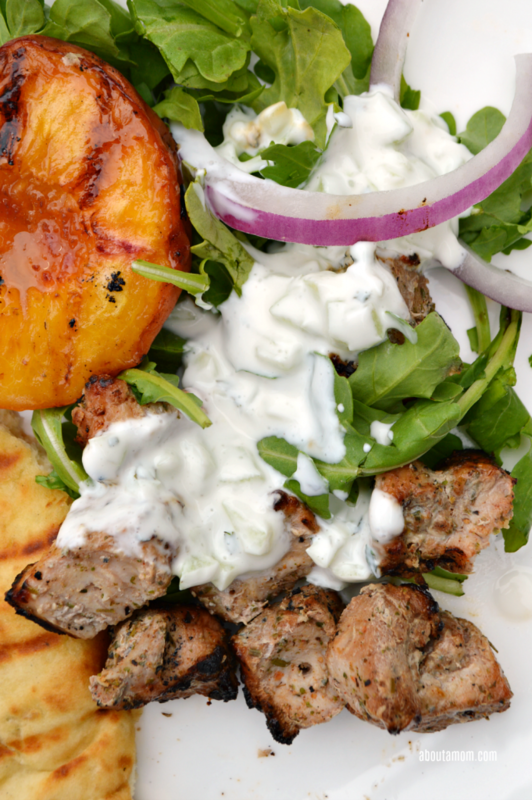 These kabobs look so good, and I love the pairing with grilled peaches. Yum! What a great summer recipe. The peaches are ready right now here. These sound very delicious, definitely going to try this recipe. These look amazing! I totally wouldn’t have thought of this on my own — thanks! That looks really goos. We love Smithfield products. This sure looks good! We haven’t grilled pork I can’t remember ever! We have been missing out. I want to try this! WOW! Looks delicious I have a family get together in a few weeks and these would be perfect for it, Has my mouth watering already! These look amazing, delicious and filling. Something the whole family would enjoy. I love how it seems like so many summer recipes are pairing and experimenting with flavor combinations! Parts of this recipe seem unexpected to me, but that might be why I’m so interested in it– and, can’t wait to make it myself! I am BBQing this weekend. I can’t do pork (too many folks won’t eat it) but chicken. However, I am sure the sauce and peaches will go with it just as well.